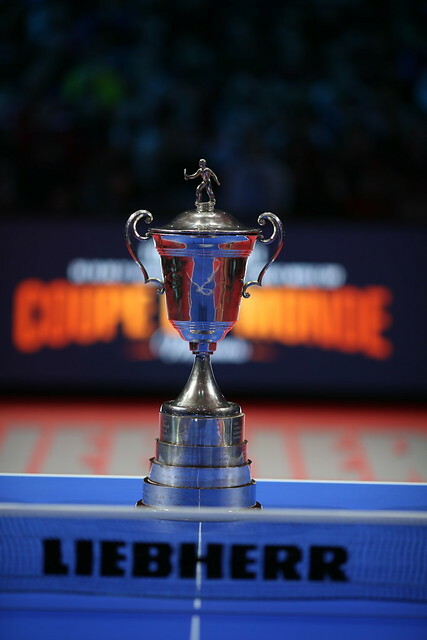 Success in the morning session of play, on the early afternoon of Friday 19th October at the Liebherr 2018 ITTF Men’s World Cup in Paris, that level of success continued for the host nation’s Simon Gauzy, Korea Republic’s Jang Seongeun and Denmark’s Jonathan Groth. Alas for Brazil’s Hugo Calderano, it was the reverse scenario. The no.9 seed, the highest rated player in the initial phase of proceedings, the 22 year old from Rio de Janeiro was beaten in five games by the most experienced of all, the player 20 years his senior; he experienced defeat at the hands of Vladimir Samsonov of Belarus, the no.15 seed (10-12, 11-9, 11-7, 14-12, 13-11). “Today was the first time that I’d played against Hugo. I already knew that he’s a very, very strong player considering how highly ranked he is. It was my first match of the tournament, so I didn’t really know what to expect. At the same time, I knew that Hugo had lost earlier. He knew that he’d have to beat me in order to reach the last 16, so he was probably under a bit of pressure. I think that he had his chances to win at least two or three games, so it was a close contest. The result means that for Hugo Calderano it is the end of the road. It also means that France is guaranteed a both representatives in the first round; as the second series of matches in the group stage of proceedings came to a close, Simon Gauzy, the no.10 seed, secured first place in his group. He recovered from a three games to nil deficit to beat Nigeria’s Quadri Aruna, the no.14 seed, in seven games (7-11, 10-12, 5-11, 11-9, 11-6, 11-5, 11-5); earlier he had accounted for Kanak Jha of the United States, the no.18 seed (11-6, 12-10, 13-11, 11-4). Emmanuel Lebesson, the no.17 seed, who had earlier beaten Hugo Calderano (11-9, 9-11, 7-11, 7-11, 11-4, 12-10, 11-8), now faces Vladimir Samsonov in the one remaining match in the group; whatever the outcome, with players finishing in first and second places in each group advancing to the knock-out rounds, the future of both is assured. Top spot for Simon Gauzy; likewise Korea Republic’s Jang Sangeun, the no.11 seed and Denmark’s Jonathan Groth, the no.12 seed, reserved first places. After accounting for Panagiotis Gionis of Greece, the no.19 seed (11-7, 11-6, 5-11, 11-5, 11-4), Jeong Sangeun caused Brazil more pain by beating Gustavo Tsuboi, the no.16 seed (11-5, 11-8, 11-7, 11-7); in a rather closer contest Jonathan Groth accounted for Sweden’s Mattias Falck, the no.13 seed (4-11, 11-5, 12-10, 11-7, 7-11, 5-11, 11-8), having earlier in the day beaten Australia’s Heming Hu, the no.20 seed (11-8, 11-7, 11-9, 11-4). One series of matches in the initial phase of proceedings remains.